In recent years, journalists and environmentalists have pointed urgently to the melting Arctic as a leading indicator of the growing effects of climate change. While climate change has unleashed profound transformations in the region, most commentators distort these changes by calling them unprecedented. In reality, the landscapes of the North American Arctic—as well as relations among scientists, Inuit, and federal governments— are products of the region’s colonial past. And even as policy analysts, activists, and scholars alike clamor about the future of our world’s northern rim, too few truly understand its history. 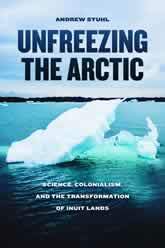 In Unfreezing the Arctic, Andrew Stuhl brings a fresh perspective to this defining challenge of our time. With a compelling narrative voice, Stuhl weaves together a wealth of distinct episodes into a transnational history of the North American Arctic, proving that a richer understanding of its social and environmental transformation can come only from studying the region’s past. Drawing on historical records and extensive ethnographic fieldwork, as well as time spent living in the Northwest Territories, he closely examines the long-running interplay of scientific exploration, colonial control, the testimony and experiences of Inuit residents, and multinational investments in natural resources. A rich and timely portrait, Unfreezing the Arctic offers a comprehensive look at scientific activity across the long twentieth century. It will be welcomed by anyone interested in political, economic, environmental, and social histories of transboundary regions the world over.